If you live in a house or a flat that has only modestly sized rooms, you may be interested in our list of imaginative tips for making them look larger. These techniques are all designed to create the appearance that a room is larger than it actually is and remove any feeling that the room is cramped or claustrophobic. Cover the floor with a set of rugs – By skilfully placing three or four rugs on the floor of a room it is possible to create the effect that it contains several separate “islands.” The impression that this creates is that the room is larger than it actually is. 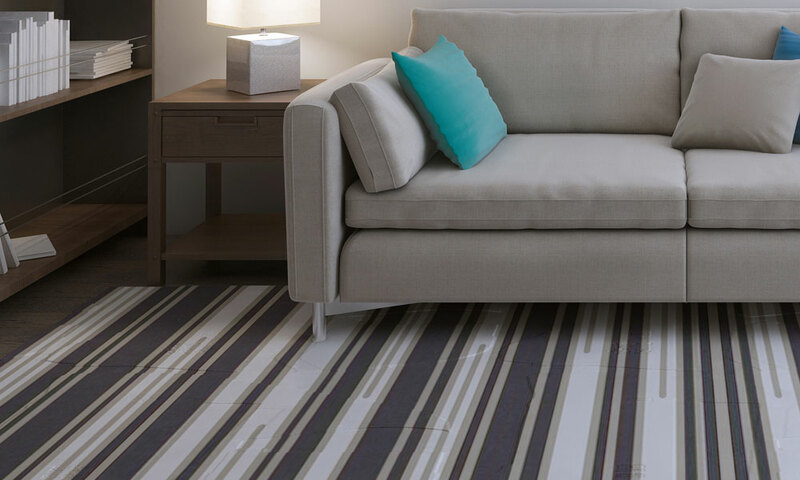 Choose striped floor coverings – A striped rug or carpet that runs the length of the room gives the impression that it is of a greater depth than it is. This is similar to the impression that a person looks taller when they are wearing clothing with vertical stripes. Use light colours – Lighter colours tend to give the impression that a room is airy. Thus, when selecting wall coverings, carpets, rugs and soft furnishings, lighter colours should be chosen if you wish to make the room seem larger. The most effective colours are white, neutral and pastel. Employ mirrors – Strategically placed mirrors can also create the impression that the dimensions of a room are greater than they actually are and do not take up much of the valuable floor space. Choose floorboards – Parallel floorboards work in the same way as a striped rug or carpet in creating the impression of greater depth to a room. Keep the furniture in proportion – Investing in smaller furnishings, which are in proportion to the limited size of the room will make the most of the space that is available and remove the impression that the room is cluttered. Keep the ceiling light – Painting or wallpapering the ceiling in a light colour also has the effect of “opening” a room up and making its dimensions seem bigger than they actually are. Decorate the walls – When considering the paintings, photographs and art work for the walls of the room, it is more effective, if the intention is to make the room seem bigger, to select one or two larger pieces than a selection of smaller ones. Enhance the lighting – Bright light makes a small room look bigger and if the lights are recessed they will not take up any of the limited space available. Keep the windows clear – Natural light is equally effective in creating the illusion of greater size. If you are able to leave the window or windows free of any curtains it should have the desired effect. Another source of natural light is a skylight, which is similarly effective. A small room need not look cramped, cluttered and claustrophobic. Imaginative use of the space available, through the way in which you select and manage the décor, really can make smaller rooms look larger.